Washington, DC — As part of its work to build the pipeline for conservation technology and innovation, Conservation X Labs hosted leading researchers and educators from nine American colleges and universities at the Smithsonian’s National Museum of the American Indian to re-envision the conservation curriculum of the 21st century. 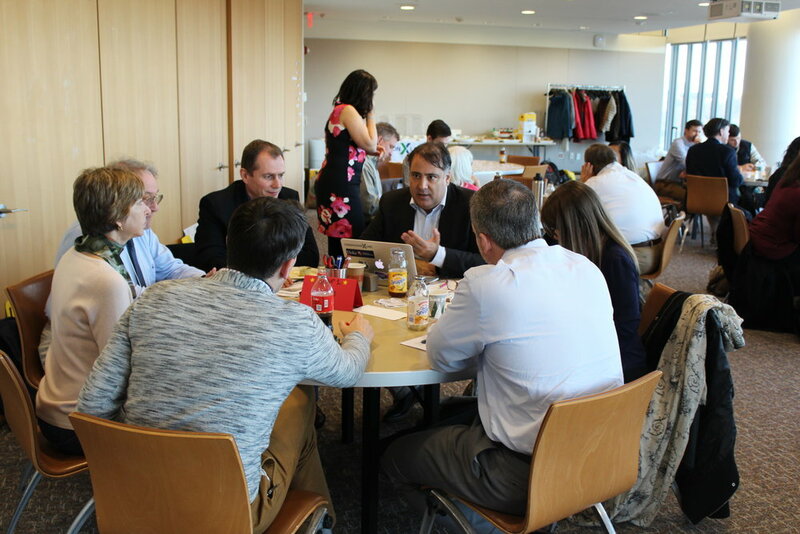 Alex Dehgan, CEO of Conservation X Labs, facilitates a group discussion. Spurred by inter-institutional exchange and faculty from a wide range of disciplines, participants of the mid-December convening charted a series of modular competencies and proficiencies that would prepare learners of all levels to address the scope and scale of problems the planet faces. With support from the Moxie Foundation, the Conservation 3.0 Curriculum Convening resulted in an interdisciplinary set of core competencies and proficiencies and an initial set of learning modules that educators around the world could adopt in their teaching and in the field. Faculty pitch their group’s conservation curriculum core following inter-institutional exchange. The consortium of attending faculty and researchers represented a diverse range of disciplines including environmental science, ecology and conservation biology, biomedical technology, business and social entrepreneurship, and development engineering as well as a range of higher education and research institutions including the Smithsonian, Duke University, Arizona State University, George Mason University, Middlebury College, Georgetown University, Virginia Tech, William & Mary, the University of Colorado, Boulder, and the University of the District of Columbia. The results of an intensive curriculum co-design session. Attendees shared the work and perspectives of their institutions, developed a series of core competencies and proficiencies in breakout groups that were voted on by the broader gathering, and designed the initial learning outcomes, materials, and components of the selected “core” over the course of the full-day event. The selected modular “core” included Complex Systems Thinking & Analysis, Adaptive Human-Centered Design, Applied Implementation Sciences, Ethics, and Communications & Marketing. Conservation X Labs, participating faculty, and their associated departments and schools will pilot learning modules in 2019 and explore opportunities to refine and iterate on modules and grow the impact of the Consortium. Interested faculty and institutions should contact Conservation X Labs at info@conservationxlabs.org to join the curricula co-design process and Conservation 3.0 Consortium. Conservation X Labs and the DNA Barcode Scanner were featured in stories for bioGraphic and The Atlantic on the growing movement of technology for conservation. The profiles focused on our DNA Barcode Scanner and its potential to revolutionize the fight against wildlife trafficking and seafood fraud among other fields. Check out each story to learn more about what we do and how we seek to transform the field of conservation! “Conservation X Labs also wants to diversify the field of conservation itself. Right now, says Alex Dehgan, co-founder and CEO of Conservation X Labs, “The problem is that conservation is only filled with conservationists.” Dehgan, his co-founder Paul Bunje, and their small team are working to change this, deliberately building a working environment to nurture novel, bold conservation strategies with a specific focus on technology “hacks”—taking existing tools and devices and modifying them to fit new needs. “We’ll need a tribe of hackers, makers, economists, engineers, and entrepreneurs to help a sometimes-technophobic conservation community reverse the sixth mass extinction,” Dehgan says. In other words, they’re forcing a culture clash. The company, with support from the World Wildlife Fund, will soon launch an online digital makerspace, where these disparate groups can find each other and work together to create real-world devices, software, and other tech solutions that can chip away at some of the world’s most pressing environmental problems. “We can do this,” declared the big round pins on the chests of attendees at the first annual Innovation Summit on Overcoming the Invasive Species Challenge. Cohosted by the National Invasive Species Council (NISC), the conference brought together leading scientists, innovators and entrepreneurs to examine new solutions to the severe consequences of invasive species on Monday, December 5th, at the National Museum of the American Indian in Washington, DC. The newly launched Innovation and Design for Global Grand Challenges MOOC explores current global challenges in conservation and development taught by Alex Dehgan, CEO of Conservation X Labs. The course is free and covers topics from wildlife trafficking to global health, 3D printing and synthetic biology. Launched in July 2016, the course has registered 1,500 students from 75 countries. On February 29, Australia’s Department of Foreign Affairs and Trade (DFAT), in partnership with Conservation X Labs, SecondMuse, NineSigma, and the World Wildlife Fund, launched the Blue Economy Challenge­ — an innovation challenge that aims to transform the aquaculture industry, particularly in the Indian Ocean region. An interview with Alex Dehgan, CEO of Conservation X Labs, on why innovation is needed in conservation and how to harness the power of entrepreneurship to save the planet’s biodiversity.